We will work with customers to maximize satisfaction for online orders. Web returns must follow the RMA process and must be done within 60 days from the date of purchase. We encourage you to return your product as soon as possible to ensure prompt refunds and availability of replacement products. We cannot exchange products through the website. 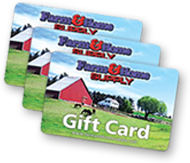 Please visit your local Farm & Home Supply store to exchange merchandise. To be eligible for a web return or exchange, your item must be unused and in the same condition that you received it. It must also include the original packaging, even if opened. *For products puchased from one of our physical stores, please contact your local store to discuss their return and exchange policies. To return an order, please access your order history on our website to complete the RMA (return merchandise authorization) process. There you are able to specify which items you wish to return and why. We will approve or reject the RMA request, and may include comments or offer alternatives to a return. Please do not return the items until we have provided an authorized RMA. If you experience problems or would like to speak with customer support, please email us at help@farmandhomesupply.com. You can also call us at 217-214-9448, Monday-Friday, 8am-4:30pm Central to discuss your options. There are certain situations where only partial refunds are granted. We may, at our sole discretion, issue store credits that can only be used in our online website store. You may bring your product to one of our stores and they will assist you with the RMA process. You must have your order information (order confirmation email or invoice/packing slip) to complete the store-based returns process. Stores are unable to issue refunds at the store. Instead, they will send your product back to our distribution center at no cost, where it will be inspected and processed for a refund through the website. You will receive a refund to the original method of payment used to purchase the product. Emails will be sent to the address on file to update you during the RMA process. Gift returns will result in a refund to the purchaser. Exchanges of website orders are only possible at one of our physical stores. Please see the Exchanges section below for details. For faster service at our stores, please complete this RMA form and bring it with you to the store with your merchandise. Several types of goods are exempt from being returned. Perishable goods such as human food and animal food cannot be returned. We also do not accept products such as intimate or sanitary goods, hazardous materials, or flammable liquids or gases. This list is not complete and may change without notice. If you are approved, then your refund will be processed, and a credit will automatically be applied to your credit card or original method of payment, usually within several days. If you’ve done all of this and you still have not received your refund yet, please contact us at help@farmandhomesupply.com. We cannot process exchanges online using the RMA process. If you want another item, please login and complete the RMA process. Your item will be treated like a normal RMA, resulting in a refund. You have to purchase the different item, either from our website or from one of our stores. You can only return an item within 60 days from purchase. You can exchange website orders at one of our physical stores for a like item of equal or greater value (customer pays difference for more expensive products). Please have your order information (order confirmation email or packing slip) either printed out or displayed on your phone along with the original packaging. An associate will assist you in finding a replacement. Shipping charges will not be refunded. You can only return an item within 60 days from purchase. If you received products from our website as a gift, you may return the product using the RMA process. The refund will be issued to the purchaser. You may exchange items at one of our physical stores or contact the person who bought you the item to make arrangements. We apologize for any inconvenience. You will be responsible for paying for your own shipping costs for returning your item. Shipping costs are non-refundable. If you receive a refund from a returned product, the cost of return shipping will be deducted from your refund. You should consider using a trackable shipping service. For expensive and/or fragile items, purchasing shipping insurance is recommended. We can’t guarantee that we will receive your returned item. We may, at our sole discretion, issue a refund for shipping costs for certain situations such as receiving the wrong product, the product is defective upon receipt, or other circumstances beyond the control of the customer. Selecting the wrong size, quantity or color, or similar customer-controlled circumstances typically result in non-refunded shipping costs. Please contact us to discuss your specific situation.